Parasuco Canada is celebrating Black Friday Canada 2014. 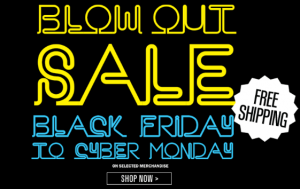 You can shop at Parasuco Canada Online to enjoy their Black Friday Canada 2014 Blow Out Sale! From Black Friday November 28th, 2014 until December 1st, 2014 you can shop at Parasuco Canada Online to enjoy their hot blow out sale offers! Men, check out the Parasuco Label Short Sleeve Tee Shirts! They come in green and white, and were regularly $44.99. Now they are only $19.98 which is pretty hot! Ladies, you will love the Parasuco JOGGY Jean Rock Star Denim Romper! It was regularly $120 and now only $84.98. What an excellent outfit for the spring and summer! As part of this Black Friday Canada 2014 hot offer, you will also enjoy FREE Standard Shipping on your purchase from Parasuco Canada Online. Click here to shop at Parasuco Canada Online to enjoy their Black Friday Canada 2014 Sales and Deals.